I am an old-school gamer, and by this I don’t mean I’m in any way an elitist, or classic games are better than modern ones; rather what I’m telling you is I’m old. Now a lady never reveals her age, but I’ll put it in the ballpark for you: I owned an SNES back when they were the best console on the market. I played the original Mario Brothers and Zelda as new releases and remember a time when text-based RPGs were innovative and popular; do you remember Zork? Now it may very well be my age which makes Sir Questionnaire ($3.99) such an enjoyable game for me, but I doubt it, especially since at the time of writing this it’s number two in our hot games. It is however, not a game for everyone, as you can see by the mixed feelings expressed in our forums. Personally, I feel if you are finding the game a little lackluster you’re not seeing it as the homage to vintage games that it is. Whether developer OrangePixel set out to honor the classic games of my youth or not I can’t say, though I find it extremely unlikely they could develop Sir Questionnaire without great respect and affection for the earlier games it emulates. The opening screen already has you traveling back in time, with (purposely) pixelated images mimicking the low-res artwork of a less technological era. On your first play through you meet a few old wise men who give you the typical cryptic old man messages. This serves as the tutorial, not that a game as straightforward as Sir Questionnaire needs much guidance for the player. From there the game, at its most basic level, is just choosing between two buttons. As a kid I was obsessed with choose your own adventure stories (yes, I know they were for boys, so were computer games way back in my day), and this game really scratches the itch for them I didn’t even know I still had. The choices are simple: walk, attack, escape, search, grab, drink, open… such simple one-word commands to choose from. You never know what will happen when you choose an action either. For instance, when you use the milk it may be old and take some hit points, or it may be perfectly fine and replenish some health. This carries over into some of your potions as well; nothing is a sure thing in noble Sir Questionnaire’s world. OrangePixel describes the game as a hack ‘n’ slash, turn based, roguelike and that is exactly what they delivered, in a very simplistic and retro format. It would be easy to dismiss Sir Questionnaire as one-dimensional and unsophisticated, but you really shouldn’t be so quick to judge. Things are not as undemanding as the first few play throughs lead you to believe. You travel through the dungeon, floor by floor, killing monsters, collecting loot, and snapping photos to fill your codex. Taking photos of the monsters is cool, giving a little in-game achievement to aspire to. You will quickly lose track of which monsters you have photographed, but that is ok–look down into the left corner and if you see the camera icon, you don’t have the photo. Your inventory management is another way the game loses its simplicity. All equipment you collect is limited to a number of uses, which displays underneath its symbol once you equip it. This means you are juggling not only the management of health-related consumables, but also when to equip your better weapons and shields for maximum ease of creature killing. Do you equip that shield as soon as you find it and risk not having it in a harder fight, or do you take a chance unshielded and maybe not make it to that tougher fight at all? Every game starts by letting you choose a quest for the play through, and if you manage to complete the quest you are rewarded with a nice stash of loot for your next game. The rooms seem to be quite random so replayability is a non-issue. There is a need for skill in choosing which inventory to use and when, however the outcome of your battles rely heavily on luck as well. You need to get the right drops, the right monsters, find the keys… so many things need to align themselves to get further into the game. Luck is such an integral part of the game it is one of the stats you can increase when leveling up. One player in our forums actually won the game in his first play through, something I still haven’t done in the countless tries I’ve had while getting ready to write the review. 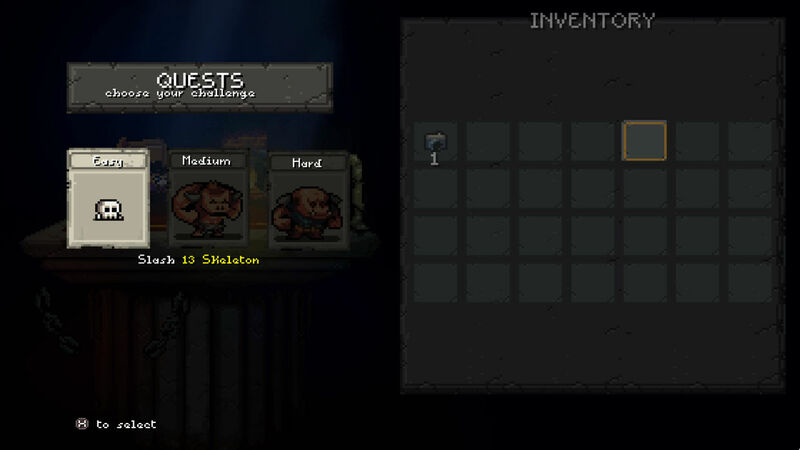 OrangePixel have already updated the game to make finding the dungeon master and winning the game so early less likely, as well as adding Game Center achievements for those of us who like them. I stopped writing long enough to play a couple of times after the update and there are some awesome new things to experience in the depths of the dungeon. To get to the next floor you need to fight ten creatures, but not every room has a monster in it. Some have statues, others a throne, or even a merchant. 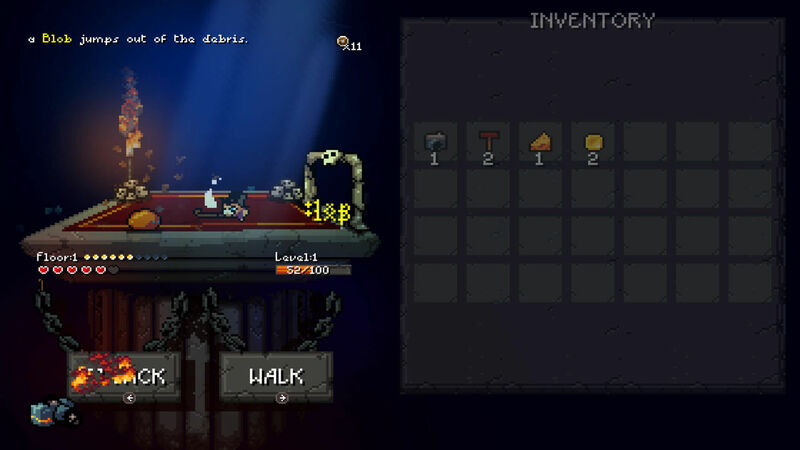 There are chests you can open with keys you find, and a skull key will open one of the labyrinths allowing you to get a crown if you make it through and beat the mini boss at the end. I’ll let you discover for yourself what happens if you sit on a throne with a crown. Sir Questionnaire may not be for everyone, but that’s ok, it would be a boring world of games if we all liked exactly the same thing. However, if you’re looking for a game with a great retro feel, lots to discover and awesome replayability, it is an absolute must. If you like choose your own adventures, Zelda, or Zork, this game is for you. If, just like me, you’re just an aging gamer looking for some nostalgia in a modern gaming world, then this is the game to download.